1 photograph : b&w ; 19 x 20 in. 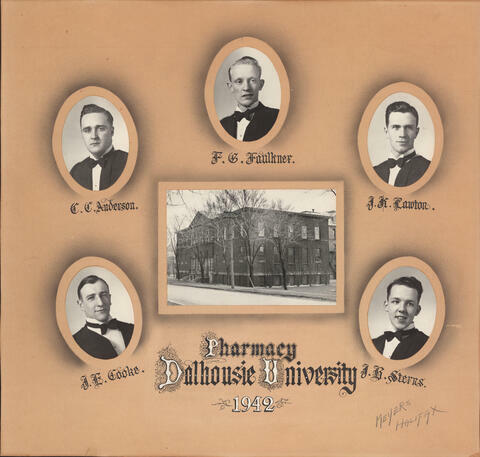 Item is a collage of the Dalhousie University Pharmacy class of 1942. The collage consists of photographs of C. T. Anderson; J. E. Cooke; F. G. Faulkner; J. K. Lawton; and J. R. Sterns arranged around a photograph of the Medical Sciences Building, later the George A. Burbidge Pharmacy Building (1968). Photograph is mounted on a matboard. Lower edge of matboard is slightly damaged.